If the first part of Steven Spielberg’s career can be summarize by a general movement toward the lights in the sky, like Roy Neary in Close Encounters of the Third Kind, from the 90’s and forward his cinema is exemplified by characters trying to flee artifices that have become dangerous: now, they have to get out of Jurassic Park’s island. 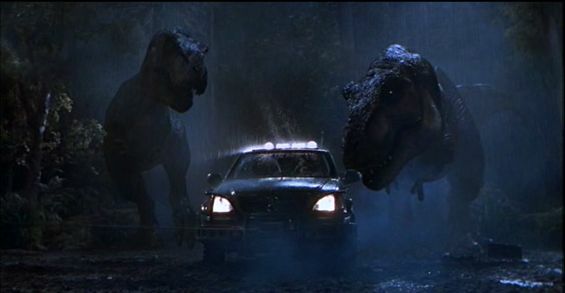 This change of course came gradually: it was clearly in effect in Jurassic Park (1993), the second major stepping stone in Spielberg’s cinema after CEot3K, but it was first introduced at the end of Always (1989), where Richard Dreyfuss (Pete) has to learn the responsibilities he eschewed as Roy Neary. Dorinda (Holy Hunter) is constantly trying to keep her aviator lover (Dreyfuss) on the ground, or at least to stop his dangerous behavior. “You’re not a movie hero” she says to him at one point, “you’re not saving any life here”, so no need to seek these narcissistic adrenaline thrills because you got some responsibilities, here with me. Or, if you will, no need for this pure entertainment, or to revel in your own technical virtuosity: cinema has a duty towards reality, and images should not be used to escape from or to hide the real world (as Jaws already implied). In the last sequence of Always, Dorinda’s plane crashes in a lake where she lets herself drown, hoping to leave a reality she doesn’t want to participate in anymore. This time, Dreyfuss (remember he’s Spielberg’s alter ego) takes her hand and brings her back on the ground, back to her earthly responsibilities, thus correcting his own decision at the end of CEot3K. This time, we need to stay with our two feet on the ground, not in the sky or at the bottom of a lake. And if it wasn’t clear enough, when Pete and Dorinda are walking together in one of the last shot, we distinctly hear in the music the characteristic notes used in CEot3K to communicate with the aliens. Admittedly, it’s a rather oblique self-critic, and maybe we wouldn’t even notice it if Spielberg didn’t carry it and develop it further in his later movies, but that’s exactly how we can view movies through the lens of an author: a small scene in an apparently minor movie finds a new meaning when you see it in context with what came before and after. Like I wrote in my introductory post A Thoughtful Love, we follow an author’s images as if they were his chain of thoughts, and the ending of Always is the bridge between CEot3K and Jurassic Park. We could always interpret Always outside of Spielberg’s oeuvre, but then we would miss a large part of what the movie means. This kind of self-reflecting moment is what makes an author so precious, and what makes the experience of his movies so intimate, even when they seem trivial (although I think Always is quite good). In 1993, Spielberg brought to the screens two seemingly antagonist productions: Schindler’s List, a serious movie on the most difficult subject possible, and Jurassic Park, another light entertainment from the guy who gave us the Indiana Jones. 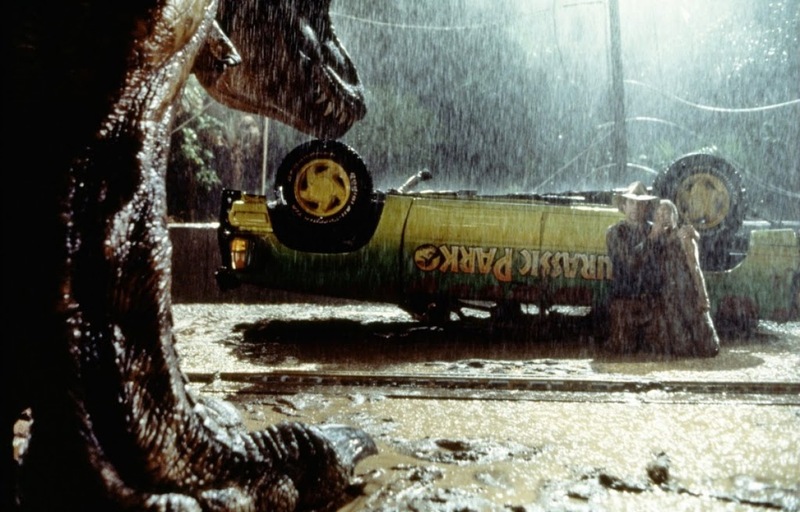 These dissimilarities are superficial at best: Jurassic Park is as personal as Schindler’s List, maybe more so, and together they operate quite a radical rupture in Spielberg’s career, the latter by explicitly presenting the filmmaker’s desire to speak about reality with a new-found maturity, the former by expressing some doubts about his past movies’ aesthetic. With Jurassic Park, Spielberg was trying to get rid of his reputation as a perpetually amazed child before he could present to the world what he probably considered as his most important and intimate work yet – but in vain, his virtual dinosaurs are renowned for their breakthrough in the special effect department, while they were really a cautionary tale on how these very artifices can go wrong. So, Sam Neill plays Dr. Grant, an archeologist, but unlike his other spielbergian colleague, Indiana Jones the lone adventurer, Grant has a real job; he’s no fantasy hero. He’s even stuck with a kind of adoptive (and unwanted) family, two children who he has to protect, forcing him to learn his responsibilities as a father. Also, as implied in my introduction, Jurassic Park’s structure is an answer to CEot3K: this time, the characters are imprisoned inside the spectacle, in an attraction park from which they try to escape, and when they leave for the sky at the end, they’re fleeing from the island of illusions in order to go back in the real world. Spielberg’s “magic” is now criticize, with the character of John Hammond (Richard Attenborough) standing as another alter ego for Spielberg: they’re both creators of their own Jurassic Park (the movie and the attraction park), and Hammond’s childish naivety is similar to our usual perception of the filmmaker. By showing how Hammond’s ambitions become dangerous, Spielberg is also raising questions about his own movies and their artifices. For example, when the visitors see the dinosaurs for the first time, the spectator shares their wonderment toward these magnificent creatures (at least we’re supposed to): the characters are bewildered by Hammond who successfully recreated through genetics a lost species, while the spectator is astonished by Spielberg’s technical mastery, capable of presenting seemingly realist dinosaurs on the screen. But this is the only moment where wonderment is possible, for us and the characters, because after that everything goes wrong: the dinosaurs are sick, they managed to procreate, they get out of their cages, and the three doctors (Grant, Sattler, Malcolm) repeatedly state their apprehensions toward Hammond’s project. Only the lawyer demonstrates some enthusiasm, but he’s clearly not meant to be a likeable character, and it’s no coincidence if he’s the first one killed by this dangerous spectacle of which he saw only the commercial potential. Toward the end of the movie, Dr. Sattler (Laura Dern) confronts Hammond one last time, and he then defends his spectacle in a speech that could have come directly out of Spielberg’s mouth: “You know the first attraction I built when I came down from Scotland was a flea circus. Petticoat Lane. Really quite wonderful. We had a wee trapeze, a merry-go carousel. And a see-saw. They all moved, motorized, of course, but people would say they could see the fleas. “No, I can see the fleas. Mummy, can’t you see the fleas?” Clown fleas, highwire fleas and fleas on parade. But with this place … I wanted to give them something that wasn’t an illusion. Something that was real. Something they could see, and touch. An aim not devoid of merit.” “It’s still the flea circus. It’s all an illusion” answers Sattler, speaking to both Hammond and Spielberg. My cinema was based on illusions, says Spielberg in Jurassic Park, and now it’s time to go back in the world. Not only illusions, should I say, but also potentially dangerous ones, and especially so for the kids, whose parents seem unwilling to educate them on how to interpret an image: in Jurassic Park, it’s as if Spielberg was saying: “why are you bringing your kids to see my violent movies, my attraction park? See how it’s unsafe for them? See how, as a parent, you need to educate them on how to see a spectacle, how you need to protect them from this horror, like Grant does?” This idea gets clearer in Jurassic Park: The Lost World (1996) coming after three years of silence, the longest pause in Spielberg’s career (during which he started his production company, Dreamworks): the first scene shows a kid getting eaten alive by dinosaurs, the consequence of inattentive parents letting her roam alone. The Lost World is darker, more violent, the King Kong reference (another spectacle gone wrong) gets more obvious, as if Spielberg was shouting and amplifying everything he said the first time, just to make sure that we can now understand him (every important scene from the first movie is treated this way: now there’s two T-Rex chasing a car, or instead of a car hanging from a tree we have a trailer hanging from a cliff, etc.) But it’s more than a louder repetition: Spielberg adds a new dimension by introducing some doubts about his new role as a producer trying to commercialize a successful spectacle. Hammond’s figure is now transposed into the promoter for the dinosaurs hunt who makes the return to the island possible, despite Malcolm’s warnings (who even says to that producer, making the parallel explicit: “This time, you are Hammond.”) It’s a strange movie (although, in some respect, it’s more accomplished than the first one), unsure about the worth of its very existence, which can also explain the somber tone: it feels as if Spielberg, like Malcolm, didn’t want to go back on the island, but he needed to because Jurassic Park was misunderstood (or not understood at all), so the movie bears his despair and his doubts about this necessary but unwanted repetition. It’s usually said that Spielberg is not as good as he once was, that his best works are far behind him, but actually he became one of the greatest author in Hollywood at the turn of the millennium, with his three sci-fi masterpieces, in which his thoughts on images took the forefront, thus casting a new light on his whole body of work and revealing what was more or less hidden up until that point. First there’s the dystopia of A.I. (2001), a sort of future in which Spielberg’s cinema of illusions became reality, with artifices (the robots) now more human than the actual humans. Spielberg, here, makes his point perfectly clear, in case we missed it again in The Lost World: in the fair scene, artifices are thrown apart, destroyed, as if the filmmaker was also getting rid of his own artifices from the past. And in case we’re still not listening, he uses one of his best-loved movie from the 80’s, E.T., as a sort of companion piece in reverse (at the outset, there’s a similarity in the titles, a two letters abbreviation and the complete word it stands for): these two movies invite us to love a central character used as a representation of the Other, an hideous alien and an impassive robot, two metaphors for how we epistemologically relate to the others (forever unknowable and alien; we can only guess what’s going on behind someone’s else body). In A.I., the iconic moon from E.T. (symbol of comfort, synonym of home) becomes a balloon chasing the robots, refusing them the home they seek for. 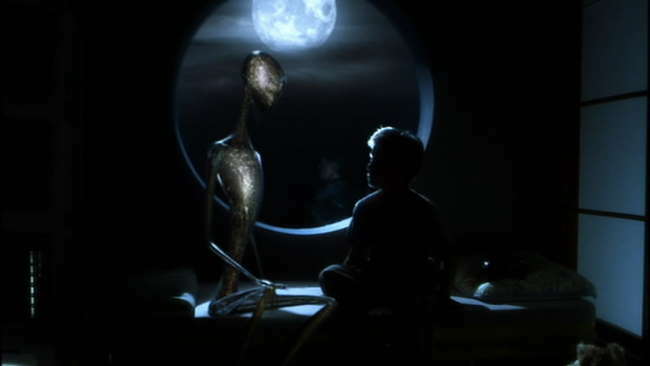 And the ending, probably Spielberg’s most misunderstood scene, is another reversal of E.T., which was closing on a real reconstituted family (with Peter Coyote as Elliot’s substitute father), while in A.I. the family is so dysfunctional that the only hope of reunion lies in a simulacra. The mother isn’t real (the robots can only maintain her image for a day), and her boy is a robot, so the only instance of mutual love in this movie occurs between a machine and an illusion; how some people may find this over-sentimental or optimist, I will never understand (it’s bleaker than anything Kubrick himself ever done!) The movie also follows Pinocchio’s structure, presenting a disenchanted version of what was (no coincidence here) Roy Neary’s favorite movie in CEot3K. But the parallel between these two movies goes deeper: the boy-robot is just like Roy Neary, both looking for a fantasy (aliens, the impossible love of a mother) that will help them escape an unbearable reality; both obtain what they wish for, but in A.I. an immense sense of loss envelops every scene, especially the end, therefore casting some doubts on the value of artifices as a salutary mean. And like in Always, the movie ends with a character stuck inside his vehicle at the bottom of the sea, until some implausible savior (a ghost, robots) comes and bring them back to life. In A.I. though, the robot is resurrected in a world of illusions where humanity is just a fading image, where he can only love a ghost mother because there’s nothing else out there (unlike Dorinda who learns to accept her lover’s death and keep her love for the living). Then we have the future of Minority Report (2002) with its oppressive surveillance system (you can be arrested before you even commit a crime), and where ubiquitous images seem to be the only way to interact with reality. The movie is less an examination of free will and determinism than an inquiry about the value of images, an exploration of their intrinsic ambiguity: can we trust images? Anderton (Tom Cruise) has to interpret the precogs’ images in order to find clues about where the next murder will occur, and when he discovers that he will himself commit a murder, Spielberg superposes an image of him-the-criminal to his current face-still-innocent, as if the future was already in effect in the present, or as if seeing this image will make this vision a reality. Even if Anderton cannot reconcile this image of him-criminal with how he perceives himself, he tries to stop it from becoming true instead of seeking for another possible interpretation of this image. But Anderton, like all the PreCrime program, doesn’t know how to interpret an image: for them, an image is a direct representation of a reality and nothing more, even if the movie makes perfectly clear, with the existence of the minority reports (when one precog doesn’t perceive the same future as the others) that these images are a perspective on a possible reality. Spielberg’s first movies were almost entirely constructed on a similar belief: for example, the ending of CEot3K presents the image of a better world that Spielberg offers as a substitute for the real world. 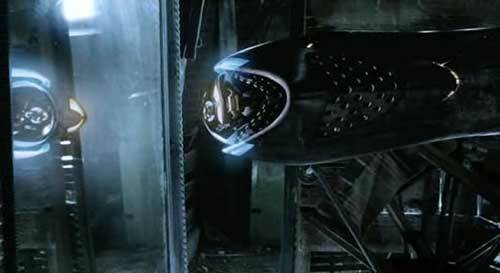 And it’s exactly what he will then put into question in the Jurassic Park’s speech: “It’s all an illusion.” An illusion is an image trying to replace reality, or trying to hide it momentarily, but in Minority Report this image of Anderton-criminal isn’t an illusion: the problem here is one of interpretation. Images, even when they’re factually true, offer only a partial understanding of reality: like the precogs saw, Anderton will hold his victim at gunpoint, and he will for a moment consider the option of murder. But Anderton never transfers this thought into action, so although the images of the precogs were right, he never commits the murder he’s accused of (the victim presses the trigger for him). In a sense though, the image of Anderton-the-murderer is still revealing something true, an inner part of himself that Anderton ignored before, these murderous thoughts he will indeed entertain for a moment. Here lies all the ambiguities of this image: it’s misleading only if we think of it as a reality, as a faithful rendition of a real event, but if view properly, on the contrary, this image can reveal something that was hidden inside of his interpreter. So Anderton has to lose his innocence toward images and learn to correctly interpret them, literally getting a new pair of eyes in the process. And this is what we have to learn about Spielberg’s cinema: Jurassic Park is only a movie about ferocious dinosaurs on a superficial level, or, as we will see, War of the Worlds (2005) isn’t simply a movie about an alien invasion. If we think of these movies only in plot terms, as if they’re merely telling a good entertaining story and nothing more, in a way they’re still illusions, at least for the eyes of such a shallow interpreter. When correctly interpreted though, these movies reveal ideas (on images, artifices, interpretation, etc. ), lurking just behind the surface. Not all images have that revealing power though: not the image forged by Burgess, the director of PreCrime who exploits this naive belief in the veracity of images to hide his murder, nor the numerous publicities that constantly surround the characters in Minority Report, trying to sell the false idea of a better reality, but then they’re only illusions, potentially dangerous. Images are powerful because they shape our perception of reality, but the best images do this by offering us an idea of reality, not by trying to replace it. It’s exactly what Spielberg does with War of the Worlds: finding a visual equivalent to the Shoah without directly representing it, trying to convey its horror in a purely visual form, while concluding this long-going query we’ve been following until now. Let’s just say I’m not afraid of superlatives when it comes to that movie: it’s the culmination of his career, his great masterpiece, and without a doubt the most important Hollywood movie of the blockbuster era. After a long period of self-questioning, during which he was trying to get rid of his narcissist artifices and open his movies to reality, Spielberg finally found a way to use the ambiguity described in Minority Report to make his most “responsible” fiction (yet, we’ll see if someday he outdoes it, but somehow I doubt it). Instead of taking us far away from a broken reality, his images now reveal it, looking to represent it as adequately as possible, in all its complexity. As A.I. was a companion piece to E.T., War of the Worlds uses Sugarland Express like a similar structural device: both are road movies where the characters are fleeing, one where the parents are trying to get their child back, at first unaware of the consequences of their irresponsible behavior (and a cartoon, images, will be the trigger that will wake up the father from his immaturity), the other with a father trying to get his children back to their mother because he doesn’t want to be responsible for them. Each time, the pursuit comes to a halt when the movie needs to establish a new step in the introspective quest of the father (in War the Worlds, as we will see, the car stops each time Ray needs to find a new way to protect his daughter’s eye from the horror). And, no surprise, the premise is another inversion of CEot3K: instead of leaving his family, the father has to protect it against the aliens (and the father’s names are quite close, Roy and Ray). As I briefly noted in my last post, about the Indiana Jones, the more responsible Spielberg’s fathers are, the more responsible his cinema becomes. I like to think of Spielberg himself as the father of a whole generation of filmmakers who imitated only the most superficial aspects of his cinema, the escape through artifice, without the personal vision and the self-doubts that grant its beauty and its significance to their father’s wandering. Now, aware of his irresponsible influence on contemporary cinema, Spielberg tries to re-educate his children-filmmaker (and film lovers) by using his images to speak about reality, while showing what was wrong with his first movies so we can stop emulating them in such a shallow manner. War of the Worlds, essentially, is a record of his failure: toward the end of the movie, Ray Ferrier (Tom Cruise) tries to hold back his son who wants to go alone and help the army. But his son doesn’t really want to fight back: first and foremost, he wants to see the war, represented in the background, beyond the hill, as flashes of white lights, as a spectacular visual ballet. “I have to see this, Dad. You have to let me go. I want to fight. Please! I have to see this”, says the son before running toward the hill, leaving his father behind. Ray, alone, stares desperately at his own conscience, now fully aware of the consequences of his education and of his absence as a father. But there’s still one hope in his daughter. At the beginning of the movie, Ray forces her to watch the electric storm, even if she’s afraid of it. “Wanna see something cool? It’s just like the 4th of July”: look at this spectacle, even if it may be dangerous it’s still entertaining, no? Ray’s relationship to his daughter is centered on the act of seeing, as he progressively learns to direct her eyes in an ethical manner: “You keep your eyes only on me, you understand? Don’t look down. Don’t look around me. I’m taking you to the car and you’re gonna want to look around… but you’re not going to, are you?” When she wants to pee in the woods (a mirror scene of a moment in Sugarland Express where the father has to protect his wife who wants to pee in a WC provided by the police), Ray argues with her about what “looking” means: him: “Stay where I can see you.”, her: “I don’t want you looking at me!”, him: “I won’t, but stay in sight.”, and her: “That’s looking!” At first, he makes her watch what she shouldn’t see, the electric storm; then, he fails to protect her as she goes in the wood and see the floating corpses on the river (he puts his hand on her eyes, but it’s too late); and finally he makes her close her eyes at the right moment, when he disappears in the dark and kills Tim Robbin’s character. In Raiders of the Lost Ark, Indy has to close his eyes to protect himself from the violent spectacle erupting from the Ark; Spielberg, though, doesn’t respect his own perspective and the spectator stays with his eyes wide open, eager to fully savor this vengeful spectacle of melting Nazis. In War of the Worlds, Spielberg doesn’t want to offer the spectacle of a man killing another man, so he keeps our eyes close like those of Ray’s daughter. There’s a difficult balance act here: surely a child should not see some things, but on the other hand we cannot completely hide the reality from them, because then we will go back to the illusion. Essentially, it was the major problem with Benigni’s despicable La vita è bella: the main character makes a game out of one of the most horrible event in human history, and tries to protect his child by concealing the existence of the Shoah and replacing it with an illusion, while the filmmaker is doing the same thing with the spectator, erasing history to protect our well-being. War of the Worlds is Spielberg best movie about the Shoah, far better than Schindler’s List, which suffers from an ending that puts too much emphasis on the survivors, while using the genocide as a tool to create melodrama (as it is shown in the infamous shower scene: Spielberg isn’t interested by the people who died in such a shower, he’s making a movie about those who survived, which in itself isn’t bad, but ethical problems arise when he uses our knowledge of the deceased to create a suspense around the shower, or a melodrama when Schindler breaks apart at the end). 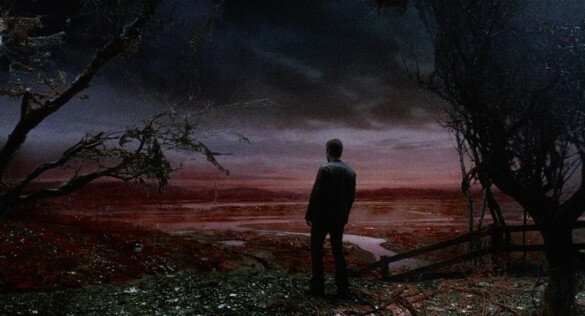 In War of the Worlds, Spielberg doesn’t try to directly represent the Holocaust, he uses iconic images like the river full of corpses, the ashes of the aliens’ victims, or a train on fire (a condensation of the two most recognizable images of the Holocaust, the trains and the oven). Furthermore, the aliens are explicitly committing genocide. They are an incomprehensible force destroying everything, which is a common idea for Spielberg: the anonymous truck, the shark, the faceless science men that terrifies E.T., the dinosaurs, etc. Evil never has a human face because it possesses no Reason (as the war in Saving Private Ryan, presented as an aberration because it obliges us to rationalize what cannot be, i.e. the value of a human life). We may know that the aliens in War of the Worlds are using humans for food, as we may know how the Nazi regime and the circumstances of the Second World War gradually lead to the Shoah, but we can’t still fully comprehend how such a thing is possible. When Ray stumbles upon an ocean of blood, this is the most perfect representation possible of the Shoah, an indirect image revealing an idea of this event, without having to show what cannot be shown, what stands beyond man’s reason. Just like Ray protects his daughter by letting her have an idea of what’s happening while trying to prevent her from directly seeing the horror, Spielberg represents this horror indirectly, through visual ideas. It must be said: we should not mistake him for some kind of moralist trying to condemn all forms of representation of violence. He’s merely raising questions by juggling with his usual themes and situations, mixing them in a new way in each movie until he finds the best configuration possible, which for now seems to be War of the Worlds. And anyway, like any ethical situation, there’s no universal law dictating what’s right or good: we can only examine the precise circumstances of each situation, and the solution, if there is one, will be different each time. But the question stands: how can we represent the horror, especially a real and historical one, while avoiding the trappings of an aesthetic that either finds some pleasure in the representation of this violence, or tone down its impact by staying too far away? For the German theorist Siegfried Kracauer, in his book Theory of Film: The Redemption of Physical Reality (1960), cinema is similar to Perseus’ mirror-shield: with its help we can approach the horror of the Medusa and decapitate it, just like cinema can help us to confront the horror through the use of representation. At two moments, two similar scenes in different movies, Spielberg uses this image of the mirror-shield: in Jurassic Park, the raptors are chasing the kids in a kitchen, where they hide themselves inside a metallic cupboard reflecting the raptors like a mirror. In War of the Worlds, in the basement where Ferrier and his daughter are hiding, an alien inspects the location with a sprawling camera on a tentacle (a superb image, by the way, of the invasion of the camera in the private sphere). Like the kids in Jurassic Park, Ferrier hides behind a mirror, where the monster only finds his own image; they’re not hiding from the horror behind an illusion, but behind a mirror of reality. And, a little aside, this camera looking at a mirror, both reflecting themselves eternally (allegory for a narcissist artifice if I ever saw one), isn’t it one of the most accurate image of our modern world?